The New Zealand Parliament passed a motion asking the Indonesian Government to allow local and international journalists to report on situation in West Papua freely, without any restrictions and persecutions. 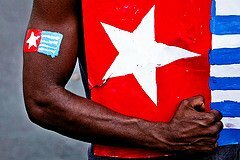 We are very happy to report that history was made yesterday [31 July 2014]as the New Zealand Parliament officially passed a motion calling for full journalist access and media freedom in West Papua. The Indonesian government still continues to ban foreign journalists from entering West Papua and forbids Papuan journalists from reporting on the real situation but yesterday on 31st July, Catherine Delahunty MP in the presence of the Prime Minister put forward the historic motion to call for media freedom in West Papua. The motion was passed with no opposition to it and now means that the New Zealand government has a national as well as moral obligation to call upon the Indonesian government to allow media freedom and international journalist access in West Papua. We are extremely happy that that government of New Zealand has taken this honorable decision to call upon Indonesia to finally let journalists into West Papua and report on what is really happening. By banning journalists from reporting, the Indonesian government is proving to the world that they have something to hide in occupied West Papua and so yesterday[31 July 2014] was an important milestone on the recognition of the problems in West Papua and of Indonesia’s cover-up. With enough of such pressure from foreign governments and from people around the world, the Indonesian government will open the doors of silence and international journalists will begin to report about the genocide and illegal occupation in West Papua. This is an incredibly significant step on the road to freedom for West Papua as when international media organisations begin to broadcast about the genocide, it will have a very strong effect on educating the world about the plight of the Papuan people. We would like to give our sincerest thanks to the New Zealand Parliament for passing this extremely important motion and we would also like to thank Mrs. Catherine Delahunty for all her many years of strong resolve in helping West Papua to be free including putting forward and winning this motion to ensure a solid national stance towards helping the West Papuan people. All across New Zealand, people are rising up to support their neighbours in West Papua.